Now that you are fully stocked on essential oils from making your own natural cleaning products what else can you do with them? Tons! Here are some of my favorite uses for all the essential oils we have around the house. And let us not forget coconut oil as the ever important base to make most of these cool things with. Teething oil : 1 tbsp. coconut oil, 3-4 drops clove oil. This will help numb the gums and provide teething relief. Test it on your own gums to make sure it’s not too powerful before lathering it on your babys gums. Vapor Rub: 1/2 cup coconut oil, 20 drops eucalyptus oil, 20 drops peppermint, 10 drops tea tree oil, 10 drops rosemary oil. Use it as you would store bought vapor rub, on your chest and back, when you’re congested. This stuff is amazing. Vaporizer Fill your vaporizer up with water and then enhance it with some oils. If you’re sick or congested add 10-20 drops (depending on the size of your humidifier or how strong you want it, I tend to like my vaporizer very strong) of tea tree oil, eucalyptus or rosemary. If you need help relaxing at night try lavender or chamomile. Bath tub Fill your tub with steaming hot water and add 5-10 drops each of lavender and chamomile. Fill a large glass with your favorite wine, and relax! Room deodorizer Start with a 4oz spray bottle almost full of water and add about 50-80 drops of your favorite oils. For a calming effect try lavender, chamomile. A great uplifting combination is lavender, sweet orange and lime. Fever reducer Start with a coconut oil base and add cooling oils such as peppermint, wintergreen or basil. Make sure you don’t apply it where it could roll into the eyes. 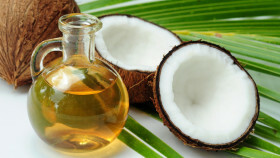 Antiseptic for bug bites, cuts and scrapes Mix coconut oil with baking soda to form a paste and add a few drops of tea tree oil as an antiseptic and some peppermint to calm the itching. Massage Oil for Constipation This is a great one to try to keep picky eaters regular. Massage clockwise over the lower abdomen to help move things along. 1/2 cup coconut oil mixed with 15 drops rosemary, 10 drops lemon, 5 drops peppermint, 5 drops tea tree oil. My 2 year old loves these belly massages and frequently requests “coco belly” when she’s backed up. Body oil This couldn’t be simpler. Start with coconut oil and add your favorite scent or combination until you find a strength you like. You can re-invent your smell whenever you like and keep playing with it until you find your own personalized smell. Have you tried any of these? What else do you use oils for? I know there’s a lot of mamas reading this that use oils much more frequently than I do. You know who you are and you know that I know who you are. Please please share. Because knowledge is power and we all want to be powerful mamas!